In Florida, a Domestic Violence charge generally means that a person has been charged with committing a violent act against someone they have or had relationship with -- be it a family member, boyfriend or girlfriend, husband or wife, even a mother or father. Domestic Violence can take many forms under the law, including charges of Stalking, Harassment or Abuse. The South Florida Domestic Violence Attorneys at Whittel & Melton represent clients charged with domestic violence in all its forms and will aggressively fight these charges, while maintaining a sensitivity to these delicate family matters. In South Florida, whenever a domestic call is made, it is law enforcement policy that regardless of who is at fault, an arrest must be made. This undermines law enforcement's ability to assess a situation to see if an arrest is even appropriate and results in many unlawful arrests. Domestic Violence is a sensitive topic that carries social consequences in addition to possible legal ramifications--which is why it so important to have an experienced Palm Beach County attorney on your side. Florida Child Abuse charges stem from allegations that a child has been abused, usually by family members, caretakers or friends. This harm can be either physical or emotional. The child's age, the type and extent of the child's injuries, and whether there was physical harm or allegations of emotional abuse determine whether this crime is charged as a misdemeanor or a felony. Many times, the court will issue a stay away order or injunction prohibiting the accused from seeing or spending time with the alleged victim in the case. When family is involved, this can be very difficult for a parent. Our attorneys are well versed in these circumstances and have successfully argued for visitation for parents charged with abuse. If you have been charged with Domestic Violence or Child Abuse, do not speak to anyone who may seem to be acting in your best interest including social workers, law enforcement officers or representatives from Children & Family Services. These people, while appearing friendly, may actually be gathering evidence against you. You should speak to a lawyer before speaking to anyone about the circumstances surrounding your case. If you or a family member has been charged with Domestic Violence or Child Abuse. Please contact us today to ensure that your legal rights are not being compromised. 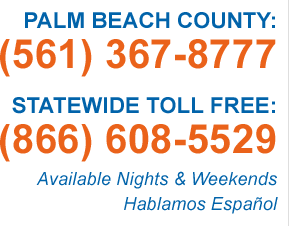 Call us today: Local (561) 367-8777 or statewide, toll-free: (866) 608-5529. Former State Rep. Baxter Troutman Charged with Domestic Battery A former Florida lawmaker has been arrested and charged with abusing his wife of 10 years, according to the Polk County Sheriff's Office. Former Rep.